The site was the former Timken Desford Steel Works, Desford Lane, Kirby Muxloe. 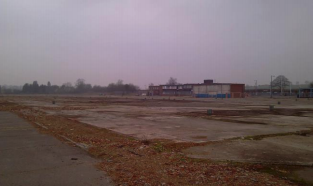 Following site closure in 2007, site investigations have been undertaken by Pick Everard to gain a better understanding of the ground conditions and possible contamination issues on the site. The site was dominated by a large concrete slab on which the (now demolished) steelworks building was constructed. Some office buildings remain in the north of the site but are largely unused at present. The site is bordered to the north by Desford Lane and to the south by a railway line and Rothley Brook. The site is bordered by a sports field to west and a warehouse building to the east. The site is being developed as a new 45,000m 2 storage and distribution centre. The prime environmental receptor was identified as the Rothley Brook, located approximately 100m south of the site. Human health protection is provided by means of the warehouse concrete base (the hardstanding being an effective pathway break). The site investigations identified the presence of soil and groundwater contamination with free product identified in a number of locations. Organic odours and black staining was recorded in many of the boreholes. Analytical evaluation showed this contamination to be predominantly “weathered” total petroleum hydrocarbons (TPH). The identified soil TPH values were as high as 34,000mg/kg with a maximum groundwater TPH concentration of 96,000µg/l). Groundwater was identified at depths ranging from 0.3m and 2.0mbgl; the groundwater levels appeared to be influenced by the presence of underground structures and buried concrete in a number of locations. Pick Everard conjectured that the groundwater flow was in a southerly / south-western direction in the west of the site and in an easterly direction in the central part of the site, ultimately flowing in both a north easterly and south easterly direction at the eastern area of the site.